Art lovers have no difficulty in recognising the work of Monet. His masterpieces were inspired by architecture, landscapes and his own garden that was described as simply magical. Claude Money was a famous art master; his painting includes Jean-Pierre Hoschede and Michel Monet on the Banks of the Epte and A Stormy Sea. Most of his paintings were inspired by the tranquil gardens in Giverny France. Often it was noted that Monet said his greatest creations was never his art but his own garden in Giverny, He filled his garden with tulips, waterlilies and dahlias plus several other flowers. This garden also featured a soon-to-be-iconic bridge with Japanese-styled arches that reached over his pond. 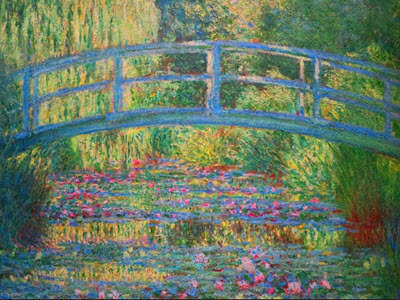 This can be seen in his painting called the Bridge Over the Pond of Water Lilies painted in 1889.Many artists of his time have said that the only way to understand and know Monet was to see his Giverny garden, there were plenty of facts about this garden that influenced this impressionist’s style. His Arrival in Giverny meant a Fresh Start for Monet. A considerable amount of hardship and negativity was part of Monet’s earlier part of life. This included his struggle, constantly with his unconcerned parents, the lack of buyers, harsh critics and all of it resulted in immense financial difficulty. His parents disowned him, his debt increased, and at the end, in retaliation, his creditors started taking some of his canvasses away. He was dealing with a lot, and in 1883, after he arrived in Giverny, his career finally changed for the good, his painting draws public interest, and he could begin to make an income from his artwork. As Monet become financially stable, he was also able to buy plants, and get gardeners to assist him in building one of the most amazing gardens. The first time he spotted the quaint village of Giverny, Monet saw it through the window of the train, it is this view of the charming village that made him walk towards the first pub once he decided to get off the train. He took a seat and ordered a jug of cider and started talking to the villagers. It was then that Monet heard that there was a carpenter who had a farm he no longer needed. The famous painter took the information seriously and first started renting it in 1883. It was at this property that his journey started and led to the painting of flowers and gardens. Way before he discovered the Giverny garden the talented painter would only paint objects created by others such as steam locomotives, haystack and the banks of the River Epte, it was things that gave him, as an artist, inspiration. It all changed once Monet stared building a pond on the property and decorated it with waterlilies that he got inspired by something he created and wanted to paint. His garden was messy, but it had balance, and it was filled with shrubbery and willows. Before he could afford the assistance of gardeners, it was his family members that helped to expand and preserve his garden. The garden he created continues to bring thousands of visitors every year to Giverny.